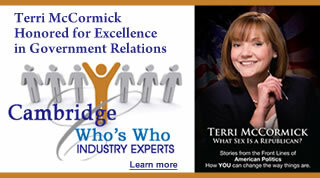 APPLETON, WI, October 18, 2011 /Cambridge Who’s Who/ — Terri J. McCormick, Author, President and Chief Executive Officer of McCormick Dawson CPG Ltd, has been recognized by Cambridge Who’s Who for showing dedication, leadership and excellence in government relations. 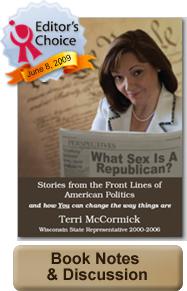 Ms. McCormick is an acclaimed author, policy expert, educator and government relations specialist. For the past decade, she has served as the president and CEO of McCormick Dawson CPG Ltd., a dedicated consulting practice that provides government relations, advertising, materials development, training and assessment services on a contractual basis. Ms. McCormick manages and negotiates contracts with the independent contractors who comprise the company. Specializing in assisting political campaigns and international schools, she successfully develops and implements innovative solutions for her clients. Furthermore, Ms. McCormick serves as a chairperson for the Speaker’s Task Force for Government Health. She is also a member of the Wisconsin State Assembly’s insurance committee and public health committee, as well as the State of Wisconsin’s interpreter committee, incentive grant committee and inter-tribal committee. Her hard work has not gone without formal recognition, however. Ms. McCormick has received a number of honors throughout her career, including an Eisenberg Award from The Wisconsin State Public Defender’s Office, a Scales of Justice Award from the Wisconsin State Bar, and a Best Practice Award from the U.S. Small Business Administration. In 2000, Ms. McCormick graduated with highest honors from Marian University with a Master of Arts in administrative leadership. She previously graduated with high honors from the University of Wisconsin with a Bachelor of Science in political science and public administration. Ms. McCormick is now pursuing a doctorate degree and intends to work for the Office of the Attorney General in the future. 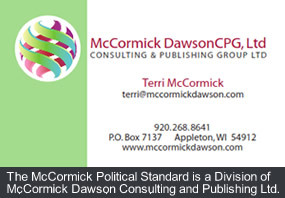 For more information about McCormick Dawson CPG Ltd, visit http://www.mccormickdawson.com.